The pentagram is a wildly used dark structure. We as believer are to build righteous structures in the air. Cost includes 428 days of access after purchase date. Are you a breaker or builder? We should be both. We need to know how to tear down the strongholds of iniquity, but we also need to know how to build fortresses of righteousness in their place, because nature abhors a vacuum. There is a substantial amount of teaching on this topic related to land, not so much about the air. 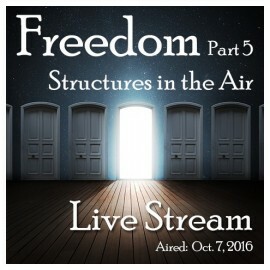 This teaching explores how the dark side builds strongholds of iniquity in the sky - the atmosphere - and shows you how to destroy those. But the real treasure is that you are given tools to establishing a fortress of righteousness in the air, if this is your calling. The Communion service models how to do warfare to destroy structures in the atmosphere. It does not model how to build a fortress of righteousness, because that requires time and a life style change. But you can take the principles of the teaching and build your own strategy for securing the atmosphere over your community. What hit me at the beginning of this lifestream is don't give up. In the case that Arthur is talking about, the enemy was able to get in after a great land cleansing through the air. And one of the great things of doing lifestreams is that you get to have communion and enter into warfare. Remember when land was something you built on or farmed? And now we have learned about the spiritual structures of land! And the sky used to be a place for birds and butterflies. Now we know it has a lot of spiritual dynamics to it. Here is an introduction to this new art.